Sam Crabtree answers the question, Why Affirm Others? 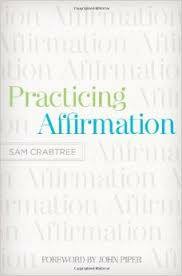 In his book Practicing Affirmation, Sam Crabtree gives 9 reasons why we should affirm others. His words are also helpful in giving “handles” in how we can love our neighbor. Affirming others earns us the right standing from which to make suggestions. It gains us a hearing. Affirmation lifts morale. It’s good for the home, the office, the church, the locker room. Affirmation energizes people. It not only lifts their spirits but motivates them to action. Affirmation of others makes us easier to live with. Striving to affirm others puts in the practice of looking at them positively — that is, looking for evidence of God’s work in them. Affirmation constructively uses time that could have been wasted complaining. By commending Christlike qualities, and celebrating them when we spot them, affirmation showcases the character of God, giving him honor for being the kind of God he is. Behaviors that are rewarded and celebrated are more likely to be repeated. So reward what you’d like to see more of. When we commend God’s image in people, God is glorified, and that’s why we were made — to glorify God. What kind of attitude will make a person a better affirmer of others? I’m not a good affirmer. I just don’t have what it takes.